SYDNEY has suffered a massive double injury blow ahead of Saturday's clash with Geelong with Lance Franklin and Dan Hannebery both ruled out. Hannebery has a groin problem and Franklin a bruised heel which he picked up in the season opener, both look set to miss multiple matches. 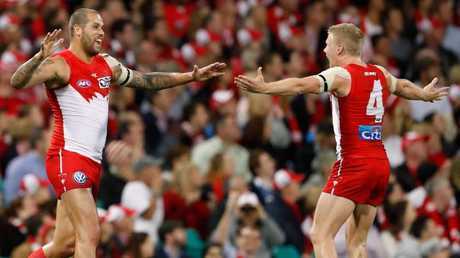 "It happened in Round 1 in Perth at Perth Stadium," Swans coach John Longmire said. "He hasn't done any training of substance since then. We've been trying to get him better week-by-week and were hoping we could get to a point where he could get through games better and do some training. "It hasn't responded and got worse on the weekend and we're not sure after that how it will respond." Longmire wouldn't rule out an extended time on the sidelines for Franklin who hasn't missed a game in more than two seasons. Lance Franklin and Dan Hannebery celebrate a goal. "It could be but we're not putting a time frame on it at the moment," Longmire said. "Two things about bruised heels, they are really painful and they're hard to get a guide on how long it takes to come back from." Hannebery could also be in for an extended time out with his groin injury. "It affected his performance so he won't play this week," Longmire said. "It's different to the one he had last year. He did have a significant groin issue last year for the whole year. This is a groin strain and we're not sure how long it will be after that."